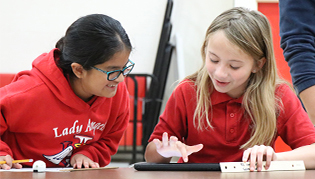 Inspired by the charism of the Sisters of the Incarnate Word and Blessed Sacrament, Incarnate Word Academy seeks to evangelize by proclaiming the good news revealed in the mystery of the Incarnation. 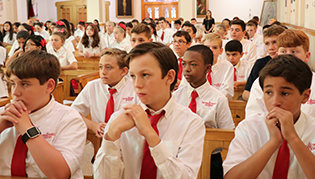 As participants in the Church's mission of Catholic education, our ministry serves students from a wide range of ethnic, economic, social, and religious backgrounds. Our service is directed toward bringing about a Christian wholeness in each person and a Christian unity among all. In pursuit of this goal, Incarnate Word Academy holds God as the highest value and affirms the sacredness and dignity of each human person. Acknowledging parents as the primary educators within the domestic church (the family), we work in collaboration with them to foster in their children the fullness of life to which they have been called. 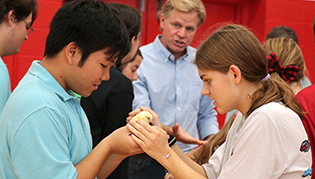 Because we recognize the spiritual, intellectual, emotional, social, physical, and creative gifts of each member of our community, we strive to nurture growth in students, parents, and faculty/staff. In this way we can best provide a holistic education to challenge, assist, and guide students in their personal development. The message of Christ as presented in Catholic doctrine and expressed in sound moral principles. The opportunity to worship in liturgical celebration and to deepen personal prayer. The experience of community through mutual support and conflict management. The introduction into a life of service to facilitate discernment of vocation. These concerns are directly addressed in the study of the Catholic religion and incorporated into the curriculum of all disciplines; they help focus student services and the school calendar. The quest for a deepening personal relationship with God. The maintenance of natural inquiry generating optimum cognitive learning. The appropriate expressions of emotional responses toward self and others. The participation in social relationships based on respect and trust, and expressed in honest communication and personal accountability. The acquisition of healthy physical practices. While completing a course of studies is never an indication that a person is finished growing, IWA does seek to facilitate the development of an individual who is able to express commitment to God and his/her faith community through witness and service; who enjoys the skills to make informed and responsible decisions; who is ready to participate in and contribute to the good of the civic community; and who-above all-witnesses to and lives as a member of the Reign of God.